Professor David Nutt, EBC president, is senior researcher in the ground breaking study on the effects of the psychedelic drug LSD on human brain. The results of the research, conducted by the Imperial College London together with the Beckley Foundation, have been summed up by international media as The Guardian, the BBC and Time. Researchers have administered LSD to volunteers and subsequently monitored them through brain scanning techniques allowing to visualize their brain activity. One of the major finding is that people under the psychedelic drug process images not only from the visual cortex, as it happens in normal conditions, but also from many other areas of the brain, which explains their dreamlike visions. Moreover, different sections of the brain were found to perform in a combined way, rather than acting as separate networks as it is usually the case. This relates to what people call “ego dissolution”, the sensation of reconnection with themselves experienced by people under LSD. 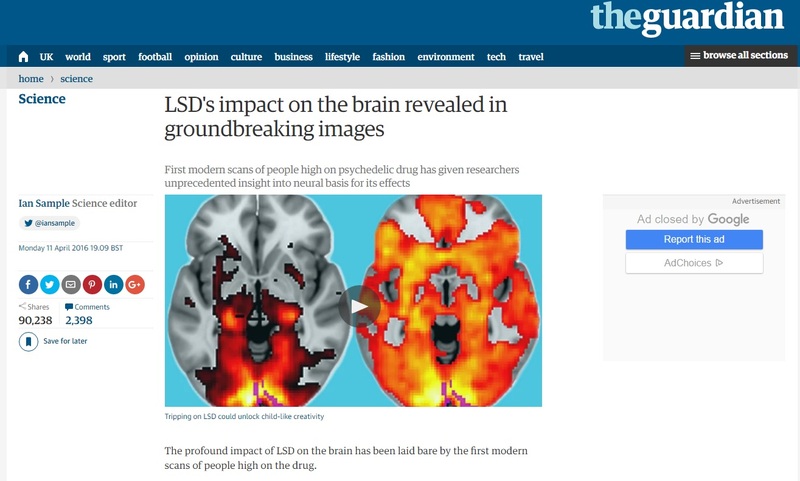 The study could also open up possibilities for further research on the potential application of LSD or related chemicals in the treatment of psychiatric disorders. For further details, read the articles on The Guardian and Times and watch BBC news illustrated.